Understandably, Mother's Day is the busiest day of the year... To avoid the heavy traffic caused by cars visiting Mount Sinai AND Forest Lawn Cemetery, we recommend that you plan your visit early in the morning or late in the afternoon. Additionally, we recommend the following alternative route so that you can avoid the traffic standstill for cars exiting the 134 East on Forest Lawn Drive. Turn Right off the Victory Blvd. exit and then make the immediate first right on Zoo Drive. Drive parallel to the 134 Freeway. When you reach the stop sign, turn right on Zoo Drive. At the Traffic Light, turn left on Forest Lawn Drive. The next traffic light you come to in Mount Sinai's Entrance Gate. Turn left to enter the park. On Sunday May 6, 2018, Mount Sinai is showing our support of Israel by hosting booths at both the Celebrate Israel Festival in Rancho Park AND the Jewish Festival in Santa Barbara! If you are at either of the festivals, please stop by to say hello and pick up some fun giveaways! Carriage Museum Parking: Enter from Castillo Street, between Yanonali and Mason Streets. Park and walk toward the Harbor, through the softball field sidewalk or along the Castillo Street sidewalk. Harbor Parking: Enter from Shoreline Drive, park and walk toward Los Banos Pool, cross the street into the park at the corner of Castillo Street. There are both paid and free spots. BlueStar Valet Parking: Along Castillo Street, between Mason St. and Cabrillo Blvd. There is no cost for this service but we highly encourage tips! 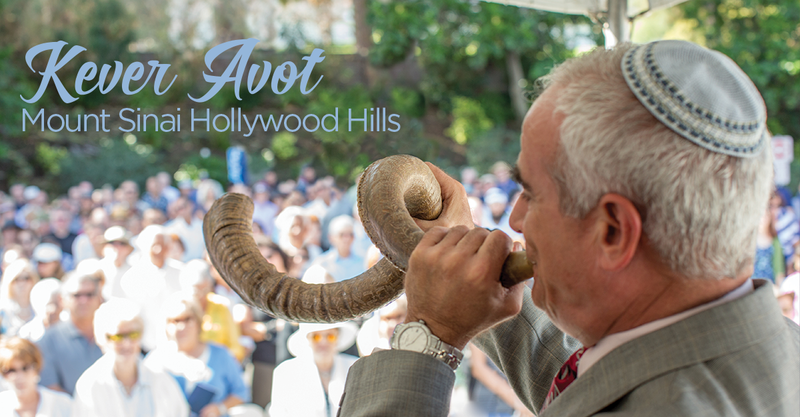 On September 24, 2017, we welcomed over 1,500 worshipers to our annual Kever Avot services at Mount Sinai Hollywood Hills and Mount Sinai Simi Valley. 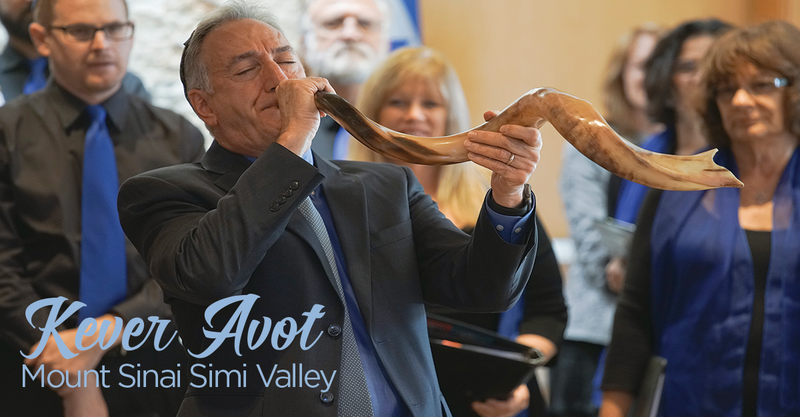 The services were led by Rabbi Nicole Guzik and Cantor Marcus Feldman of Sinai Temple at Mount Sinai Hollywood Hills and they were joined by Cantor Lisa Peicott of Sinai Temple at Mount Sinai Simi Valley. To view both 2017 Kever Avot services in their entirety, please click on the links below. 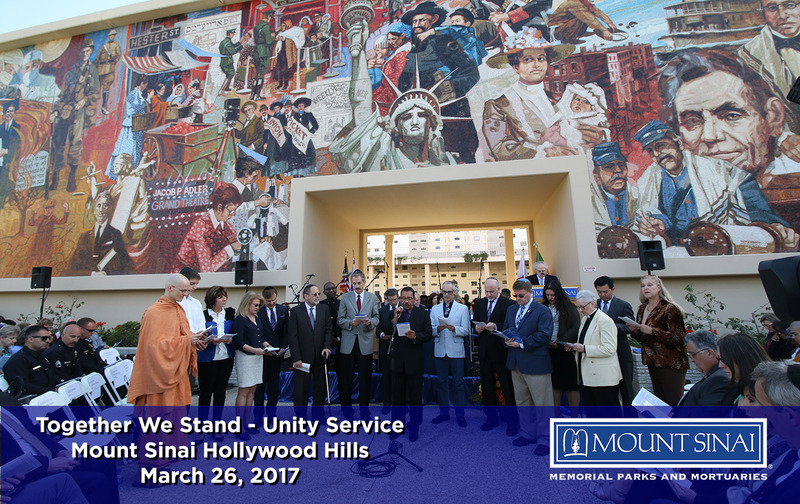 On March 26, 2017, Mount Sinai Hollywood Hills, along with the Theodore Bikel Legacy Project, hosted an Interfaith Unity Service. At this moving service, Rabbis, Imams, Ministers, Pastors, Hindu, Buddhist, Sikh priests, Native American Elders, Elected officials (City, County, and State), and community leaders joined together in prayer and song to represent the intricate tapestry of beautiful Los Angeles. Please click HERE to learn more about this multi-cultural event.